BAND-MAID opens official online goods store for foreign fans! Have you heard of BAND-MAID? The band who gained fame after their overseas world tour last year and participation at MOSHI MOSHI NIPPON FESTIVAL 2016! On 17th February, BAND-MAID’s official goods site aimed at foreigners opened to the public! You can purchase from the collection of BAND-MAID official goods. Starting with T-shirts, popular illustrator KAgaMI, who is known for having designed products for numerous famous artists, designed a total of 41 of these goods. Why was this website set up? There was a rush of queries from America, Europe, South America and many Asian countries asking whether there are any BAND-MAID goods selling. To satisfy the craving fans, this website was launched! This website is stocked with goods that have run out of stock in Japan, which is great news for fans of BAND-MAID who are in Japan! As this website was designed for foreigners, the products must be purchased in dollars, so please take care when purchasing. It has been announced that BAND-MAID will be embarking on their first one-man-tour around Japan and will perform at a rock festival! BAND-MAID is giving it their all for not just their foreign fans, but their fans in Japan too! 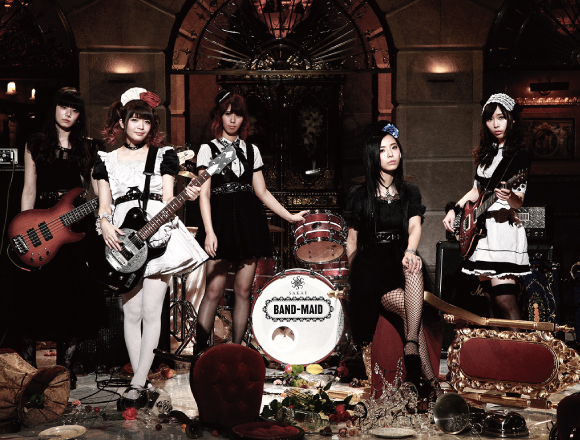 Don’t take your eyes off BAND-MAID! ■ Related article: Interview with: BAND-MAID, who just completed their first world tour to huge success!